Cataract surgery is one of the most common procedures performed in the United States, and thanks to continuing technological and procedural advancements, it is being conducted more efficiently and effectively than ever before. In fact, it is estimated that more than 4 million patients per year have successful cataract surgery. At Chester County Eye Care, our fellowship-trained cataract surgeons—Dr. John DeStafeno, Dr. Cristan Arena, and Dr. Gregory Oldham—have successfully performed over 20,000 cataract surgeries, helping numerous women and men treat this common condition and significantly improve their vision. If you are suffering from cataracts, our doctors can perform a thorough eye exam to determine if surgery is appropriate for you. In the event this procedure would be beneficial, they can then formulate and execute a customized treatment plan to help restore your eyesight with exceptional results. The information below provides some general details regarding candidacy for surgery and the typical cataract surgery experience. If you would like more information or wish to schedule a consultation, please contact Chester County Eye Care today. Ultimately, virtually anyone who has cataracts and is bothered by adverse side effects related to the condition can be considered a good candidate for cataract surgery. Once you decide to have cataract surgery, certain tests and measurements of your eye will be performed to determine the best options to correct your vision. The surgeon will review these tests and perform a thorough examination of your eyes. You and your surgeon will review your surgical options at the evaluation and decide whether to proceed with traditional cataract surgery or laser cataract surgery. Our surgical counselors will then review the surgical plan, address any questions or concerns you have, and schedule your surgery. A quick and safe outpatient procedure, the actual surgery typically takes less than 15 minutes and is performed under local or topical anesthesia. An incision is made in the cornea and then the cloudy cataract is broken up into fragments. Traditional surgery uses ultrasonic waves to break the cataract up while laser cataract surgery uses pulses of light. 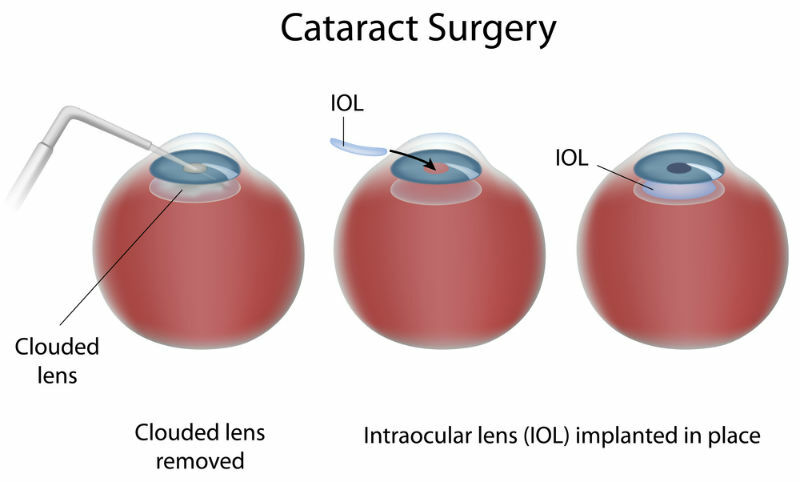 The fragments are then removed and an intraocular lens (IOL) is implanted. The second eye is typically scheduled 2-4 weeks after the first eye to allow the first eye to be fully healed. Following your cataract surgery, you will be given a detailed list of post-operative instructions including eye drop directions. Recovery from cataract surgery is quick and you will be able to return to normal activities within a short period of time. The day after your surgery, you will come in for your post-operative appointment. Though each patients healing time will vary, many people see an improvement in their vision within a few days. To learn more about cataract surgery, or if you are interested in scheduling a consultation at our practice, please contact us today.